All transactions are safe and secure with a reliable history in online purchasing behind each of our associates. 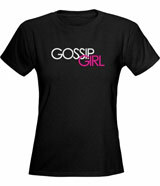 Buy the Gossip Girl Logo t-shirt to own Gossip Girl clothing and merchandise. Own this officially licensed CW Gossip Girl t-shirt that displays a white and pink logo for the CW TV Show on the chest. This women's baby doll style tee lets everyone know you attend the Constance Billard School for Girls, established in 1942. Browse for apparel with the school emblem. Constance Billard is a fictitious girls school, whose students include socialites Serena van der Woodsen (Blake Lively) and Blair Waldorf, the Queen Bee. In addition to the Gossip Girl Logo tee above, browse the Gossip Girl Clothing Gallery for more apparel like men's and women's clothes, kids shirts or hoodies.